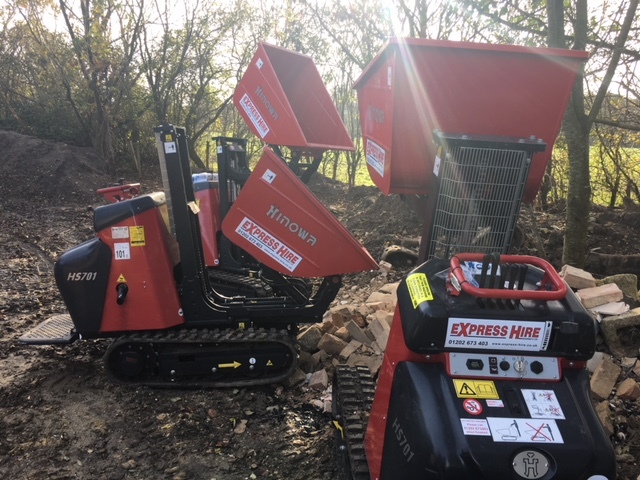 Express Hire has invested in a new fleet of Hinowa tracked mini-dumpers. 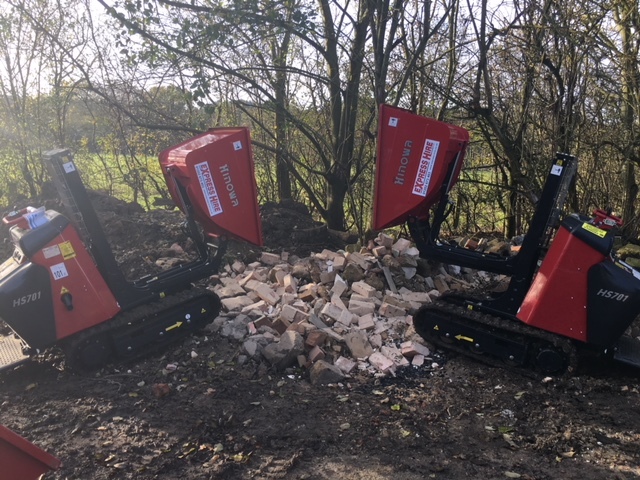 The Dorset-based plant hire specialist has purchased six Hinowa HS701 machines as direct replacements for older Hinowa models it bought four years ago. 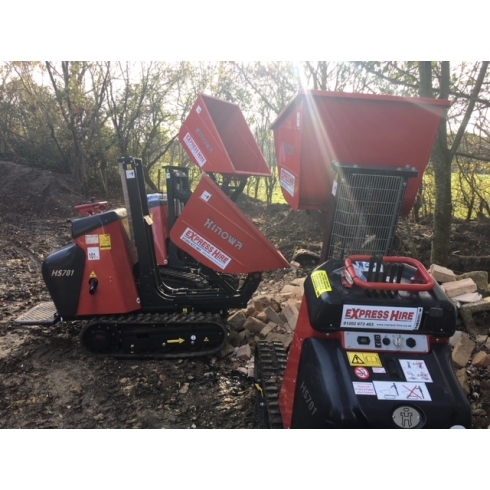 Express Hire bought the dumpers from Access Platform Sales (APS), the exclusive UK dealer for all Hinowa tracked compact plant machinery. 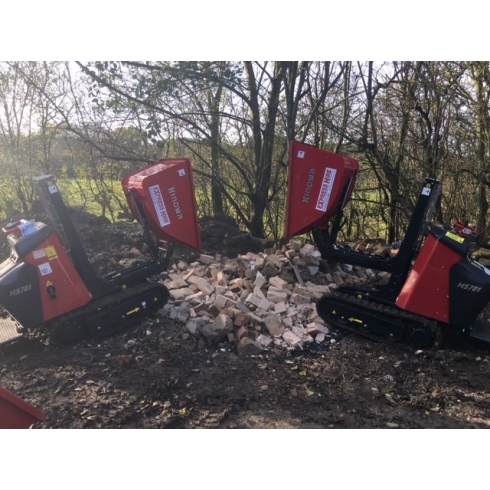 Andy George, sales and accounts manager at Express Hire, said: “The HS701 has been very successful for us, as it is a very reliable, well-designed Hinowa product. The after-sales support from APS is also very good. At just 758mm wide, the Hinowa HS701 is designed to pass easily through narrow spaces such as standard doorways and garden gates. The stand-on, 700kg capacity dumper has a mast-type hi-tip feature, enabling it to load skips, flat beds and trailers. “They work hand in hand with our Kubota micro-excavators, so typically deliver high utilisation rates,” said Andy. “They are very popular with DIY enthusiasts and with professional builders and landscapers. Compact, robust and agile, the HS701 makes fast work of moving materials such as sand, gravel, earth or shingle from one work site location to another. It is part Hinowa’s growing range of high-quality tracked dumpers, which are increasingly used for materials handling in horticulture, landscaping, agriculture, construction and estates or facilities management. The HS701 is available with a Kubota diesel engine or Honda petrol engines. The 9HP version has manual start – an industry first for this type of product. The 13HP version is designed for more intensive use, so it features electric start and a heat exchanger. All models are available with standard or self-loading dumper. APS provides nationwide sales and after-sales support for Hinowa products. This includes replacement parts, expert technical support, and refurbishment or part-exchange of old machines.